Once again we are here with some of the Top headlines in our today's Current Affairs Updates - 29th March 2018 which are going to grab your attention. Some of these includes the Tenor being acquired by Google, first Nuclear Plant in Arab, CEO of Ayush Bharat Mission, and the 350 Commemorative Coin to mark 350th Birth Anniversary of Guru Gobind Singh. These and many more have been given below. We would like to inform our readers do have a thorough look at these bullet points as they have been framed based on the pattern of Bank, SSC and Rail exams. These are not only going to help you in your preparation but is also going to help boost your knowledge. 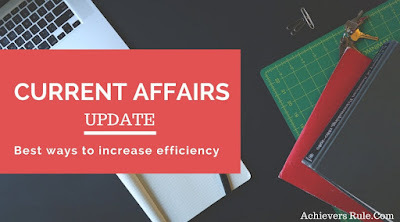 You may also like Daily Current Affairs Quiz and One Liner GK and Static Note Down Points. The Supreme Court on Tuesday appointed Justice Jawad Rahim, judicial member of the National Green Tribunal (NGT), as its acting chairperson. A bench comprising Chief Justice Dipak Misra and justices A.M. Khanwilkar and D.Y. Chandrachud said that the new acting chairperson will discharge his duties until a regular appointment is made. Myanmar's parliament has elected Win Myint as the country's next president, a week after the resignation of his predecessor. Win Myint, a close aide of Aung San Suu Kyi, has been a speaker in the lower house since 2012 and was widely tipped for the top job. The Export-Import Bank (Exim Bank) today said it will provide a USD 500 million credit facility to ECOWAS Bank for Investment and Development (EBID) to fund various development projects in the western-south Africa. Department of Posts (DoP) under Ministry of Communications has launched the Cool EMS Service between India and Japan, to be operational from Thursday. Indu Bhushan was today appointed as the Chief Executive Officer (CEO) of the Centre's ambitious Ayushman Bharat National Health Protection Mission (ABNHPM). Government will come out with a Rs 350 commemorative coin to mark 350th birth anniversary of Guru Gobind Singh, the 10th and last Sikh Guru. The United Arab Emirates (UAE) celebrated on Monday completion of the first-ever nuclear powr plant not only in the country but the whole Arab Gulf region. Google is acquiring the platform Tenor, which runs GIF-searching functionality in keyboards for phones and messenger software, including on Samsung devices and Facebook Messenger. Tech giant Microsoft has set up “The Garage” for its employees working at the Microsoft India Development Center in Hyderabad, to increase their innovative quotient and allow them to tinker with ideas to take them to the next level. Tribal Affairs Minister Jual Oram today launched 'e-Tribes:Tribes India', an initiative for digital commerce at Tribes India outlet at Mahadev Road. It included launch of e-commerce portal of TRIFED, www.tribesindia.com and M-commerce, android app 'Tribes India'. A special project under the Pradhan Mantri Kaushal Vikas Yojana has launched in six States – Assam, Bihar, Madhya Pradesh, Jharkhand, Odisha and Uttar Pradesh. Around 47,000 distribution lineman-multi skills and technical helpers will be trained in these six focus states to give fillip to rural electrification. NITI Aayog's Atal Innovation Mission (AIM) announced the signing of a Statement of Intent (SOI) with SAP to promote a culture of innovation and entrepreneurship. As part of the SOI, SAP in 2018 will adopt 100 Atal Tinkering Laboratories (ATL) for five years to nurture the science, technology, engineering and mathematics (STEM) learning among secondary school children across India. In a surprise turn of events, India and China agreed to draw up a medium- and long-term roadmap with action points and timelines to address the 51 billion dollar trade deficit between them. Multi-lateral funding agency Asian Development Bank (ADB) has approved USD 80 million loan for hill state Himachal Pradesh to fund modernisation of technical and vocational education and training (TVET) institutions and improve skills ecosystem to help boost employability of the youth. GIFT City on Monday said it has signed a Memorandum of Understanding (MoU) with Deloitte Touche Tohmatsu India LLP (DTTILLP), which renders consultancy services, for mutual cooperation in areas related to international financial services. GIFT City is a global business district offering a platform for business opportunities in international and domestic business operations. Muskan Bhanwala extended India’s individual gold medal tally to four in the penultimate event at the ISSF Junior World Cup in Sydney when she bagged the yellow medal in the Women’s 25m Pistol event. President Ram Nath Kovind presented Gallantry Awards and distinguished service decorations at the Defence Investiture Ceremony held at Rashtrapati Bhavan. Kovind presented three Kirti Chakra, India's second highest military decoration and 17 Shaurya Chakra in the grand ceremony.